On the 2nd and 3rd of May 2016, at the Media Convention, Fraunhofer FOKUS in cooperation with ARTE will showcase 360 degree technologies. With these technologies high-definition movies of the ARTE360-App will be shown on a dome as well as on a television. With the help of a remote control, visitors to the Berlin Media Convention can vary the angle of view thereby realistically looking around the films. The visitors can try out different films of the ARTE360-App: They can fly with the helicopter over the snowed summit of the Mont Blanc. They can listen to an opera singer and can watch the individual musicians of the La Scala Milan in concert. To finish off they can ascend the stratosphere in a balloon at 42km altitude. 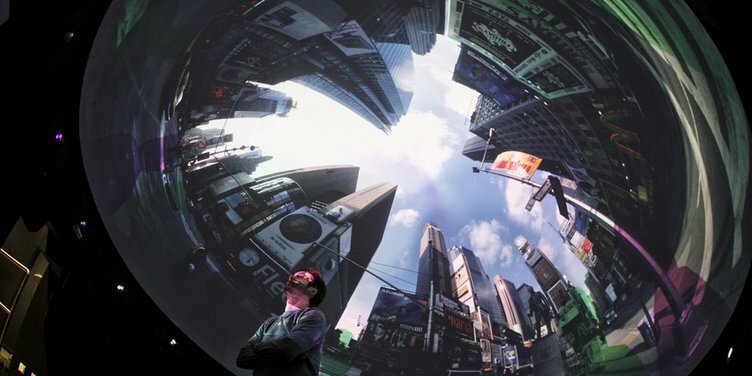 The individual walks through the virtual world involve huge amounts of data that must be processed in real-time so that the viewer can view the chosen film perspective in fluid motion and a high quality. This applies to both the display on a dome as well as on a smartphone with limited memory and restricted internet connectivity. With the 360-Degree-Video-Cloud-Streaming-Solution viewers can watch a high-definition 360 degree video on an HbbTV (Hybrid Broadcast Broadband TV)-TV or mobile device, even if the end device has a low memory and limited internet connectivity. Popular video-websites like YouTube and Facebook execute the compilation of the video content on the end device of the viewer. This results in large quantities of data on the end device the computing power of which is soon reached. Furthermore some devices like HbbTV-televisions do not have the capability to process the images by themselves. In the solution from the business unit FAME (Future Applications and Media) of Fraunhofer FOKUS only that video clip that is currently being viewed is processed in real-time on a server in a cloud-infrastructure. Merely these video-data will then be streamed to the end device. Apart from the server and the player the solution also contains an app through which the video can be controlled and the angel of view can be changed. “VR glasses have triggered hype all around virtual reality applications. Together with ARTE we will show how an immersive 360 degree cinema experience is possible also without such glasses. The advantage is that I can share my experience with others and do not walk around in a virtual world alone", says Dr. Stephan Steglich, director of the business unit Future Applications and Media. 360 degree videos are recorded with a camera cluster. The cameras are arranged spherically so that all directions are captured. The researchers of the business unit VISCOM (Visual Computing) at Fraunhofer FOKUS have developed software for the production of 360 degree videos. The software puts together the individual pictures of the camera cluster into a seamless all around image. As opposed to other solutions, this video-stitching takes place in real-time so that 360 degree videos can also be transmitted live. For the reproduction of videos in the form of a dome-projection, the VISCOM-researchers in close cooperation with Carl Zeiss have developed a media server for the control of multi-projector systems. The server ensures an auto-calibrated projection on any shaped surface and consists of the showplayer, screen-configurator and the showmanager. The showplayer presents the 360 degree video and provides each projector with its (part-)image. The image processing takes place on regular PCs therefore no special hardware is required. The screen-configurator is the planning tool. Through the screen-configurator one defines in advance the projection geometry and establishes the suitable projector setting which takes into consideration the individual projector type and determines the number of projectors, projector position and projector orientation. It is responsible for the projector auto calibration and calculates the distortion parameters required by the player to put together a seamless overall picture with regard to geometry, brightness and color from the individual images of the projectors. Through the showplayer, videos are displayed in real-time with a resolution of up to 8K x 8K. Live input can also be incorporated. For the Media Convention, the researchers have integrated a gamepad into the system to control the angel of view.